Over the last few weeks I have been progressing with the HP valve assembly – a greenly long-type piston valve (apparently). trouble you can’t manage… most notably tapers everywhere! 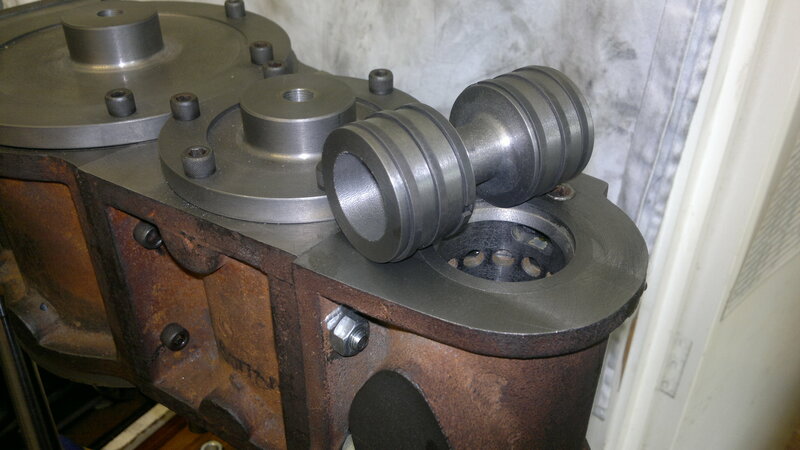 The HP Valve chest had to be bored on the lathe, as it was too small/long to be done on the Vertical Mill – as a result it had a taper on the bore of about 3thou. The piston valve liner therefore needed to be similarly tapered, and it was not possible to try the chest on the liner while being constructed – so this just makes it harder. The liner is meant to be a push fit into the valve chest, and my machinery handbook suggests that this meant there needed to be about a 1thou clearance – all a bit tight, but with carefull use of a set of inside micrometers my friend Juliet donated to me (her father’s) and a lot of carefull miking it all came good! 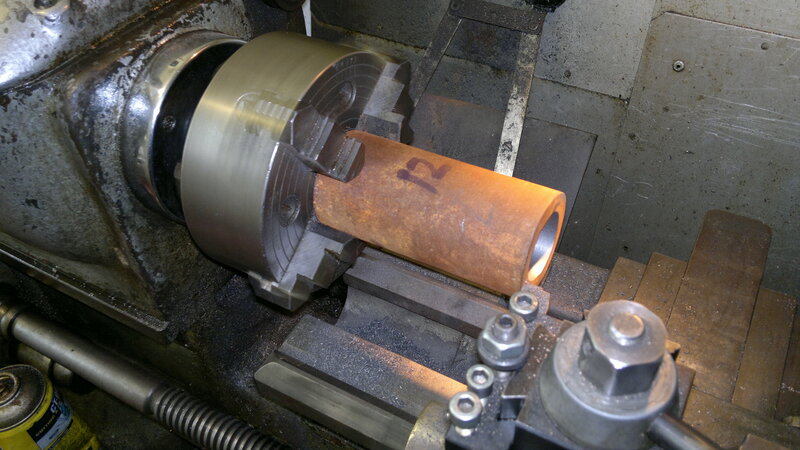 The picture above shows the first facing cuts on the liner casting in progress. 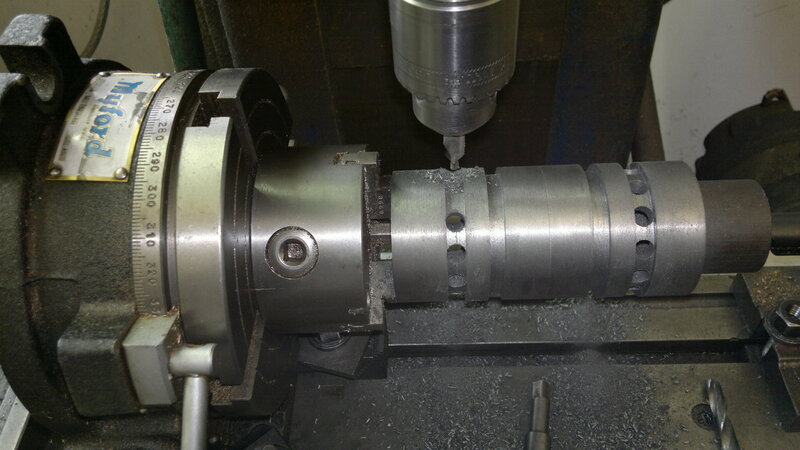 The first stage is to cut a small part of the bore at each end, and press in a centre at one end – I happened to have a bit of cast iron bar which was a nice fit – and by the three-jaw (with inside jaws at the other) and then the outside of the liner can be machined. This was carefully made with a taper to match the liner, but you can’t check the fit till you finish, as dismounting it, or removing the centre, would disturb the allignment. Later when the outside was finished I was very pleased to find that it slid in with the last 1-2 inches needing a push. At the same setting I cut the port grooves. (One of the really pleasant things about the Harrison is that it is so ridgid you can plunge a tipped parting tool in a near full speed without a jot of chatter or other pain). 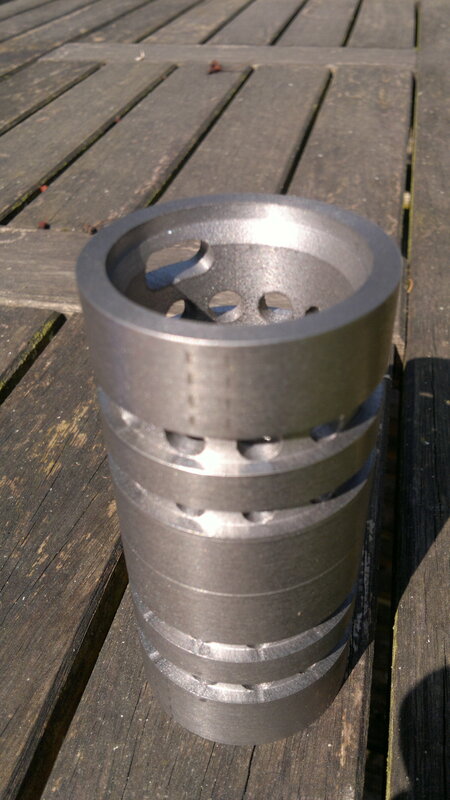 However, it was noticable that the finish I was able to get from the tool on this was no-where near as nice as I had achieved on the cylinders, some difference in the iron I imagine. 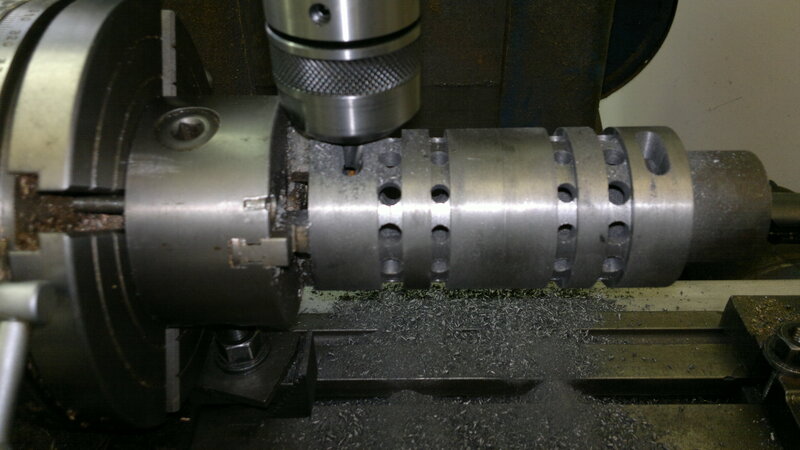 Once the outside was ready I transfered the liner to the mill and drilled the port holes using a rotary table and the DRO (to ensure perfect positioning)..
Once this was done then milling the exhaust ports was a simple slot-drill excercise. Now we are on the home stretch, a simple boring job – first make a plug gauge, but again the dreaded the tapers bite – and I discover the the inner end is about 4 thou larger!!! The book suggested using the plug gauge to lap out any such problems, but of course it is now too damb small!! 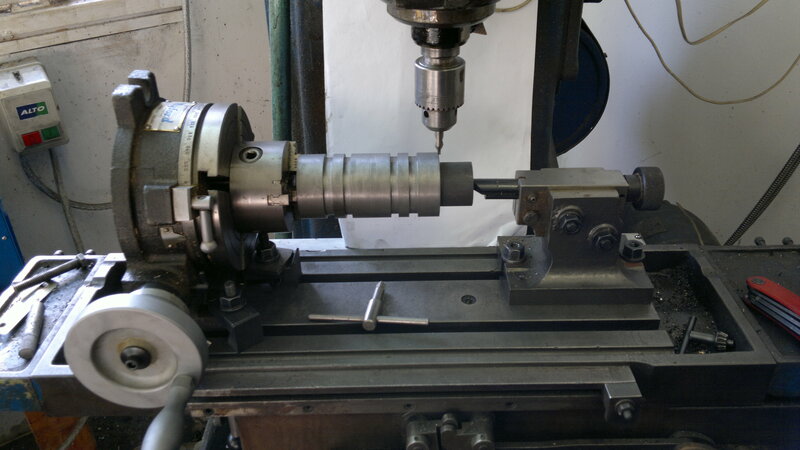 So I set to with my trusty sykes-pickavance cylinder hone (three wobbly slip-stones in a hand drill), and carefully reduced the error to about 2 thou, and decided that could be accomodated by a tapered valve and it’s rings… time will tell, but I am starting the “buy Malcolm a newer lathe fund!”. (yes I know you can see the whitness marks from the chuck jaws, but this surface is the push fit into the liner (secured with Locktite Structural Adhesive) so I am guessing it will not be a problem, and you can also see the less-than-perfect bore, but the hone cleaned this up a lot). The casting was one of the few parts which had been machined, and I would guess was the point at which the builder threw in the hand towel, as the cored recesses were not well aligned with the outside, and I think they took a starting cut over the outside, aligning things at one end, not realising the recess at the other was so far out that they then had a “scrap” valve… however my inherent tightness and belief in shrink fits took charge! so I cleaned up the errent recess and srunk in a block of cast to provide the meat to effect a repair. I used locktite structural adhesive (the yellow stuff) to fit this, I am not sure about it’s high-temperature performance, but the recommended Slow Areldite is much the same, so I am hoping. I had left the liner a few thou long to match the cylinder block, which will get a final skim over the top, and crossing my fingers, just pressed it home with the help of a G-clamp and a pair of plates – and it looks OK… Job Done! 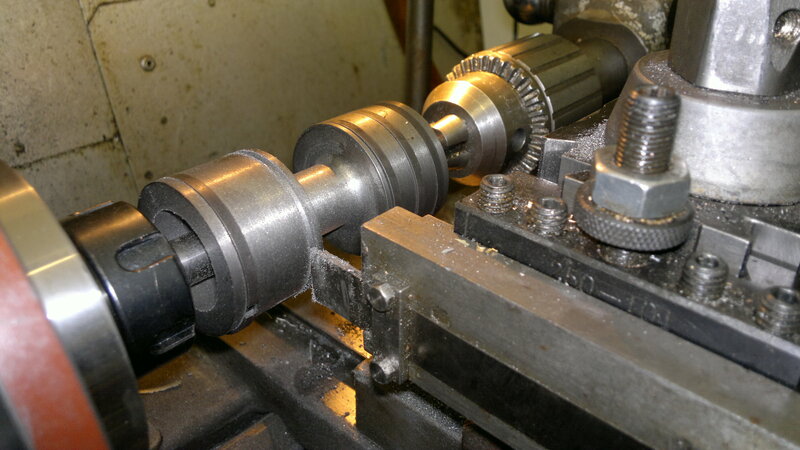 This entry was posted in The Power Plant and tagged engine build, lathe work, valve gear on March 26, 2012 by sybefur. …this section is another place where Loctite is recommended by the designer as an adhesive. This is inappropriate, as at the temperatures found in a steam engine it’s strength is all but lost. This caused the failure of the crankshaft too. For this sealing job I would recommend a compound designed for this high temperature work, For the crank, fabrication with industrial adhesives is not to be contemplated!!! Beautiful job, making patterns for a large leak at the moment , if you send me your email I will send you some photos. I have already made the crankshaft. thank for the nice words mike!